Like Tigger on Red Bull. THE SCENE: In 2002 the supremely abstracted emcee Busdriver released his critically acclaimed second disc Temporary Forever, a sonic snapshot of his madcap visions and theatrical flow. Trading the standard boom-bap for jazz licks he returned in 2004 with the dada-esque European-only Cosmic Cleavage. You know that kid in first grade who wasn’t supposed to have sugar because it made him hyper?If that kid was a rapper, this is the album he would have made. Busdriver approaches the mic as if every rhyme could be his last, so he raps at breakneck speeds, croons at different pitches and frequently gasps for oxygen, usually all within the same phrase. And with his gift to free associate without an internal censor, his raps ricochet from one subject to the next like a room filled with hundreds of tiny active Spongebob superballs, a thunderous multicolored non-stop shower of energy. The brilliance of Cosmic Cleavage is the appending of his cartoonish raps to the type of jazz that was actually used in cartoons, circa 1940. The screeching and sleazy horns of the title song evokes wolves in zoot suits brandishing oversized tommy guns down at the speakeasy. Busdriver’s rubbery cadence on “Kev’s Blistering Computer Tan” mimics Popeye’s broken down jalopy, valiantly failing to move its mismatched tires before crashing into a rusty, dust-pooting heap. Cosmic Cleavage is a concept album on mating and dating. “Nagging Nimbus ” touches on divorce, his trumpet-like voice nearly blending in with the horn section. He’s surrounded by 300 rpm rubber ducks in the girl-focused “Beauty Supply And Demand”, and he works up some unique macking in the demented tango that is “Unnecessary Thinking”. Constantly changing voices he becomes the ringmaster and tightrope walker of his own animated circus cabaret during “She-Hulk Dehorning The Illusionist”. Can he finish his rap before he runs out of air? Only on the Soul Coughing sound-alike “Pool Drowning” does he relax his one man Muppet Show vocal acrobatics, but it’s merely the eye of his clownish hurricane. 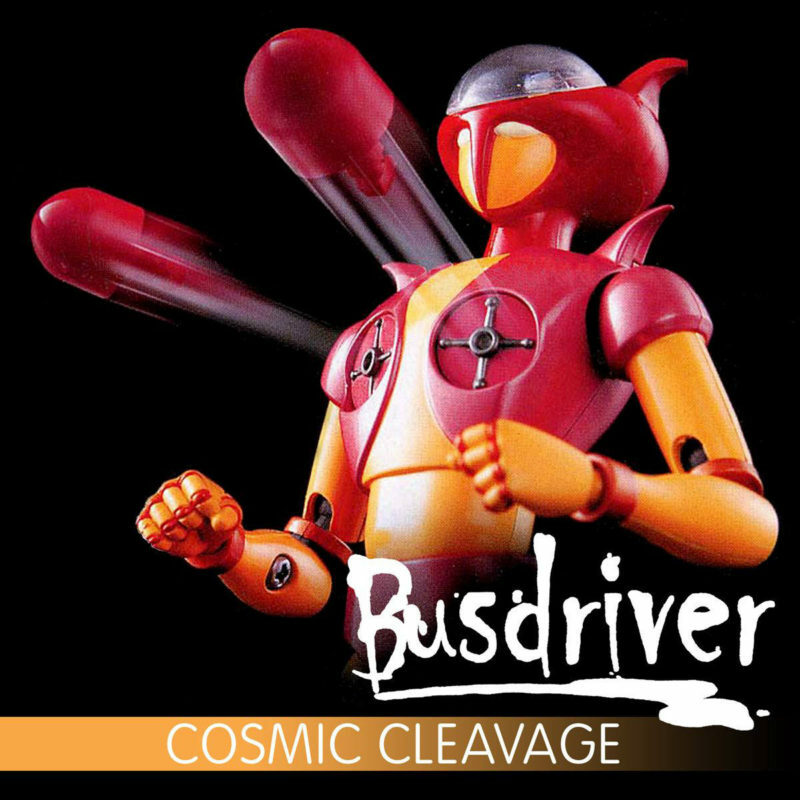 THE FALLOUT: Much like Ren & Stimpy cartoons, Busdriver is an specialized taste, and the tastemakers who flocked to Temporary Forever dropped the increasingly oddball Cosmic Cleavage like the proverbial 16-ton weight. He bounced back the following year with the easier-to-swallow Fear of a Black Tangent. Unhinged and unmedicated, Cosmic Cleavage rolls you inside the many cerebral folds of Busdriver’s cortex, and shows you what he’s made from. NEXT WEEK: Meet dUg (sic). All respects due to Paris Zax, but the sounds that Daddy Kev and Driver make are unmatched. now that i see the driver review i cant wait for the next. glad to see you back. Busdriver, along with Aceyalone & the Freestyle Fellowship / Project Blowed affiliated artists create true new jazz – not just raps over jazz samples or hip hop with jazz guest stars. Busdriver is the schizophrenic, manic sound of modern life in L.A.